We’ve talked curries before, here at PCFG. And for good reason too; they’re delicious one-pot dishes that are cheap and easy to make, with very little clean up. This recipe for chicken jalfrezi is a bit similar to chicken tikka masala, however the curry sauce it produces is a lot thicker and chunkier, almost similar to chicken cacciatore. It also packs a little more of a spicy kick to it, unlike chicken tikka, though this can be adjusted to your liking by omitting the chipotle peppers, or adding your own chilli peppers and spices. Originally jalfrezi was developed as a Middle Eastern curry dish, which served as a means to easily recycle leftovers. Meats and veggies that were past their prime could easily be thrown together in a nice tomato curry sauce to little consequence, since the spices used in these dishes usually are strong enough to just take over the entire recipe. When making it at home for yourself you can use fresh ingredients, or you can do it up oldschool by using some leftovers too. I’ve found that using leftover baked potatoes works particularly well in it. Regardless though personally, I find this a lot easier to prepare than chicken tikka masala in part due to the lower number of ingredients. So actually, if you’re in the mood for curry and pressed for time, chicken jalfrezi is the way to go. Coat bottom of frying pan with olive oil and begin heating on medium flame. Clean chicken breasts and cut into medium pieces, 2”-3” in size. Add minced garlic to hot oil and begin to sauté for 2 minutes. Add sliced onions and sauté for another minute. Add chicken into pan and little by little, add cumin, turmeric, chilli powder, salt, and pepper to chicken while stirring to ensure even coating. Cook chicken in pan for approximately 7-10 minutes, or until chicken is browned on all sides. Lower flame to low heat, and add in crushed tomatoes. Stir sauce and chicken and then cover. Allow to simmer for 15 minutes. Uncover pan and add in butter. Stir as it melts, to incorporate evenly into sauce. Add in additional garlic cloves and potato. Stir in the cumin, coriander, ginger, chipotle, and cilantro until well blended. Add salt and pepper to taste. Raise heat to high and cook curry for 5 more minutes, stirring occasionally. Serve hot in pan. Feeds approx three to four people. *To par cook your potatoes, poke holes in them with a fork, wrap in a damp paper towel, and cook in the microwave for approximately 6 minutes (though cooking time will vary depending on the potatoes and your microwave). You want them to be mostly cooked, but not fall apart mushy. 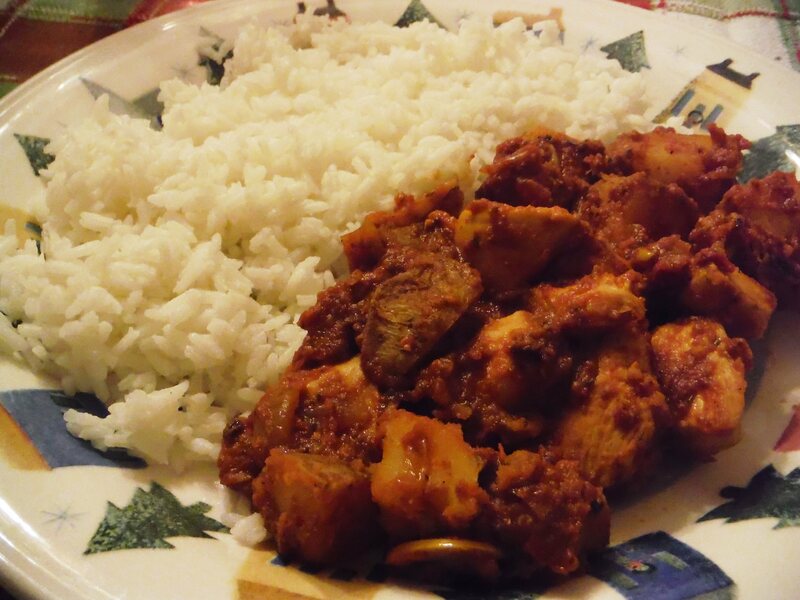 Posted on December 10, 2014, in Etcetera and tagged Asian, chicken, easy, Indian, recipes, spices. Bookmark the permalink. 2 Comments.